These batch powder booths are designed for a wide variety of powder coating production applications. Air is drawn into the open face of the booth, across the work area and through the filter bank in the rear wall. 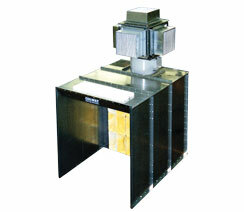 Our innovatively-designed MERV 14 dual-filtration system traps the airborne overspray powder before it is drawn through the exhaust fan and discharged back into your shop. The booths are available in a wide range of sizes to meet your production requirements. Custom sizes are also available.